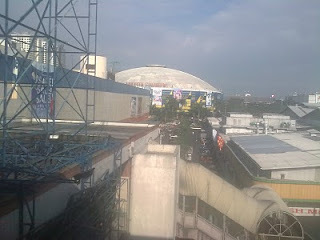 Arriving in Manila, I get to see few changes in the district. “The Exact Fare Only” sign at the MRT station has improved. Oh well, the banner was sponsored by an advertiser. But one thing that’s quite peculiar is to see another sign written on a piece of paper which reads “DUE TO COIN SHORTAGE, PLEASE PREPARE ONE OR TWO PESO COIN. THANKS.” Isn’t that ridiculous? Are they running out of coins as it reaches to hundreds thousands of people paying the ticket for a train ride? Or they just don’t want to do the math for the paper bills? Whatever their reason is, the post is annoying. Are some of these arrogant ticket sellers won’t issue a pass to the paying mass without preparing one or two peso coin, just the same thing that they did in the past if people did not prepare an exact fare? I am just only asking. Just a few years back, I wrote a blog in a networking site about “Exact Fare Only” that stated the banner should be well presented instead of writing the notice in a piece of bond paper so that it won’t look cheap. Again, it has now improved. As it takes some time to get an advertiser, perhaps they should keep another sponsor for this new notice. Oh boy, it can’t be denied that there are so many good inventors in our country; just to make everything easier. I have missed the cut by writing on my personalized blog the first day of this year because I have been so busy with my new found niche, the search engine optimization just to get the business website into the top. Writing articles are mentally and physically draining that even the heat of the computer immersing towards my skin keeps me so enervated. In fact, I was been even off-guard with myself that I no longer hold any good and sound sleep because I really wanted to have new leads and new customers for my business. I am straight with my goal, that is why I am doing everything I could to get the fruit of my labor. My friend told me that SEO is not an easy job, because she herself is a writer and we are on the same boat. It needs sacrifices, patience because SEO writing is really time consuming. In due course, everything will pay off because rewards can be found at the edge. Anyway, it's still a New Year!! !